This is a story of 3 generations. Grandmother Jackie purchased one of my programs for her daughter Nicole, as a present, and also one for her self. 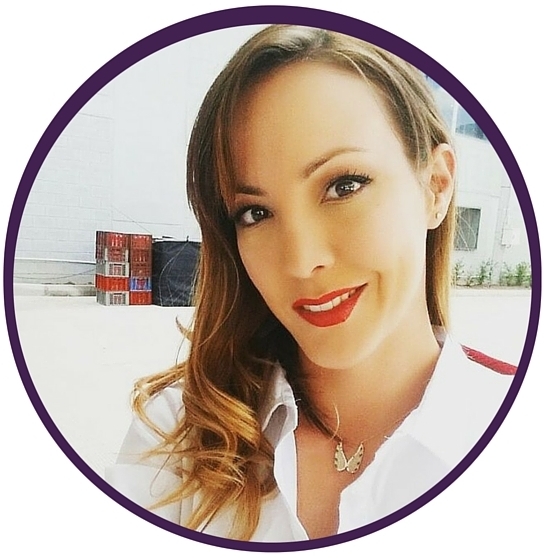 Jackie, a very strong and passionate woman felt that she was in survival mode and that she was not living and experiencing all the possibilities that life has to offer. She felt that she had stopped enjoying her day to day life and there was a need to start a new chapter in her journey. Jackie also wanted to share with her daughter what life had taught her in terms of never losing passion, nor the confidence to start again when she felt that a change was needed. This is how I ended up sharing one of my programs with a mum and daughter. We started working together redefining the women they wanted to be, we created an image for both of them based on the lifestyle they have that at the same time allowed them to transition to what they wanted to become in the future. I helped Jackie understand the colours that work best for her complexion. I also showed her the styles that would create a more balanced figure. We also worked on her vision for her life and what she needed to change to start feeling more passionate about life. With Nicole, we had to do a little bit more digging and soul searching. In this process, she realised that she could make her life something more exciting and that having a busy life, as a mum and teacher, wasn’t an excuse to start losing sight of herself at such a young age. We created a beautiful wardrobe for Nicole, something that was dynamic and comfortable for the teacher and the mum. We figured out the best type of make up for her and one that was really easy and quick to apply. The results couldn’t have been better. A couple of months after working with them, they wanted to come to see me in person and show me the result of their transformation. Both of them had lost weight, had new hairstyles and most importantly, they were feeling proud of who they are. Jackie said to me “I have made a move to a career in real state. These days I wake up and start my days feeling great, with purpose, having fun with make up, clothes and with my clients. I have decided how I want to look each day”. She shared a story about how confident she felt when she was surprise interviewed by the local newspaper. “I looked so good and felt so confident, whereas before I would have run away and hidden” – she said. The story doesn’t end here, and it is when the third generation gets involved!!! 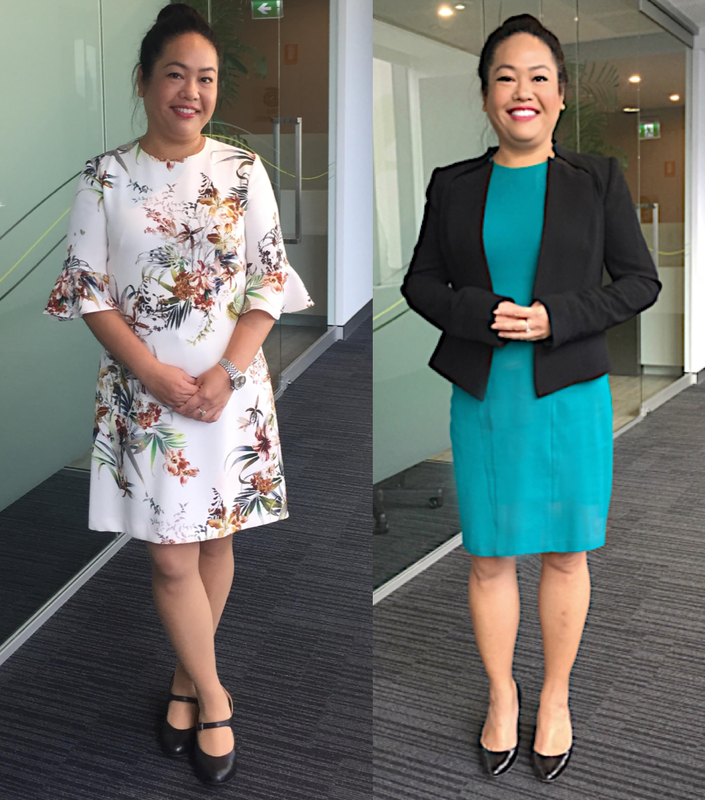 Nicole and Jackie have not only transformed themselves, but have been sharing what they have learnt about confidence and femininity with the little grand daughter. Both mum and daughter have seen the positive effect that their new attitude has had on the little one’s confidence. Naomi is a young professional woman, wife and mum of a baby girl. She works at one of the big mining companies in a community engagement role. She had been on maternity leave after giving birth for the last 4 months when I first met her. My initial contact with Naomi was on a wardrobe consultation and shopping trip she had purchased through my website. I contacted her after receiving her booking and asked her to share her story with me and what she was looking for. This is what she said: “I'm very much in the public eye, but I try to avoid it when I can due to a lack of confidence with my image to the point that I have turned down a promotion at work. I am on maternity leave after giving birth to my beautiful daughter and I am due to go back to work in the next couple of months… My main frustration with my image is that I've simply lost touch with it… I was a city girl who was confident and loved fashion…always wearing the latest trends and having to work in flashy corporate offices. However, since moving to the Pilbara Region for work, I have replaced my power suits with mining gear… Newman (Western Australia) is also always so hot and dusty so I avoid buying nice clothes and investing in nice hair as I feel it is such a waste…This has been going on for 7 years and I really need to get the old me back, to feel confident with my own style...but I want to do it properly hence why I have contacted you... I'm starting from scratch in terms of style and wardrobe so I would really appreciate your guidance and assistance”. I got back to her explaining that I could definitely guide her with her wardrobe and the shopping trip. However, I also explained that I would be of more help working on her whole style and image. This was a more holistic way to work and ultimately a better way to create lasting changes in her life. She immediately agreed and we started straight away with her program. Naomi had shared with me how in the past she had rejected a promotion for lack of confidence. But now she was now ready to step up. As soon as we started working together she started feeling much more confident within herself. She got to know herself better, connect to her desires and how she wanted to be perceived. She learnt about her body shape and was able to fully understand what styles and colours were perfect for her unique body shape and personality. She learnt about how to make the most out of her presence and how to approach a conversation with confidence. She was finally able to bring forward the confident and beautiful woman she truly was. On our last session, I could see a different attitude in her and a very confident smile. Naomi is now standing with confidence and is seen as the leader in her industry as she desired. Soon after this first day back, she was offered a promotion and she took it with open arms. Let me share Lisa’s story with you. She came to see me because she was tired of not being taken seriously enough at work. She is the co-owner of a commercial real estate agency. Her partner in business is a man and in most of the meetings they have with clients or stakeholders, people would almost ignore her thinking she was his assistant. When I started explaining to Lisa the impression she was creating, she was able to understand why people were ignoring her. She is a very feminine woman who dresses in a very feminine way and has a very quiet voice. She also has a very shy personality. Nothing wrong with this, except that when you want to get yourself noticed and be taken serious, your image must portray credibility and power. You can dress and use your body language to come across as more approachable or more credible. You can adjust between these 2 positions depending on the situation and the impression you want to create. We started analysing the colours and styles that Lisa loves. We analysed her body language and her overall appearance and presence. She scored a 5/10 in a credibility analysis we conducted for her. Based on this analysis, we defined the styles, colours and contrast levels that would help her look more credible. We also worked on her body language and the tools she can use to add more impact and credibility to her words as well. We created a detailed plan for her image in which she felt 100% comfortable. Instead of wearing a lot of flowery patterns, light fabrics and colours, which create a very feminine look, Lisa was happy to start creating a more powerful look by adding stronger colours to her wardrobe in more structured outfits. She still wanted to wear her frilly tops and light colours. However, she was happy to leave them for other days when she was not attending important meetings that required her to command authority. She was also happy incorporating ways to be more charismatic through her body language. I taught her how to come across as a more credible woman. This was not about changing Lisa’s personality, as I am all about staying true to who you are! This process was about teaching her the style and body language tools, so that she could learn how to balance her femininity with her credibility as required. This was a complete revelation for Lisa. She was able to balance how she dresses and how she uses her body language to create an image that was a true reflection of the capable, intelligent woman she is. She was able to walk into the boardroom holding her head high. She was comfortable addressing people from all walks of life and able to command power when she needed to. On my follow up catch up with her after we finished the program, Lisa shared with me how she had to run a meeting where she needed to make 3 people redundant in her team. Usually such a daunting task, she said she had never felt so confident going into a meeting and the eventual outcome was actually the best one possible for everyone involved. Lisa now has all the tools to get the credibility and attention she deserves from any person she shares her beautiful personality with. When I first met Denise she had just moved to Perth from New Zealand. She was starting a new job role and she was seeking a promotion within the same company. She is a very intelligent and capable woman, however she has been hiding behind a lot of black and greys. “It is easy to pick outfits in the morning but I do admit I am not excited about what I am wearing and know I am not standing out or creating a memorable impression. I look bland and I feel bland” she told me. We started working together and I helped Denise understand the colours that work best for her beautiful blue eyes and natural complexion. We worked out the best type of make up for her and one that didn’t have to take more than 5 minutes to apply. She learnt about the styles that would enhance her body shape and help to downplay some parts of her body, with the intention of creating a more balanced figure. We also worked on her body language and how she could use it to create a more powerful first impression and be noticed. But most importantly we worked on her confidence. She needed to first feel happy within her own skin before being able to feel confident to stand out. Denise understood that there were 2 types of work: visible work and invisible work. She had been doing invisible work for a few months. She learnt that she had to be visible and confident at meetings and when talking to her boss. She developed the skill of confidence. She became confident in standing out. A couple of months after we finished working together, she contacted me to let me know that she had been successful in obtaining the internal promotion she was seeking and she was now a Manager overseeing a staff of 30 people. 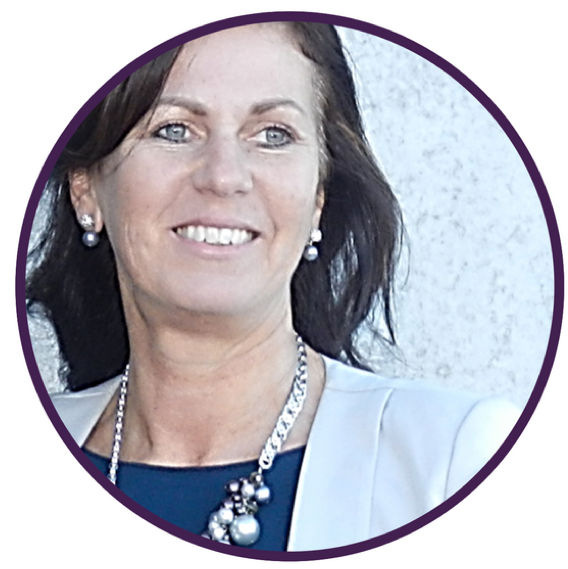 Jacinta is a super woman; a busy mum, dedicated wife and employed as a Workers Compensation Injury Manager. She had been trying to get her life sorted, and there was something inside telling her that she needed to regain a bit of the woman she had lost connection with over the last 20 years. She used to be an athlete in her mid 20s but with the passing years and busy life style she had led, she was slowly losing not only her shape, but also her drive to look good. The first thing that she mentioned when we met was her struggles with deciding what to wear, and how this has over time created a serious lack of confidence. She had a really good way to tell when she was looking good. She realised that when she looked good, she would feel good as well. The only problem was she didn’t know how to achieve this every day and without the effort and time it was currently taking her to get to that point. The reason that she joined my program was her desire to learn how to dress in a way that represented what she truly was. She wanted to regain the confidence she had lost over the years, to leave behind the reason she has not lived a fulfilling life. 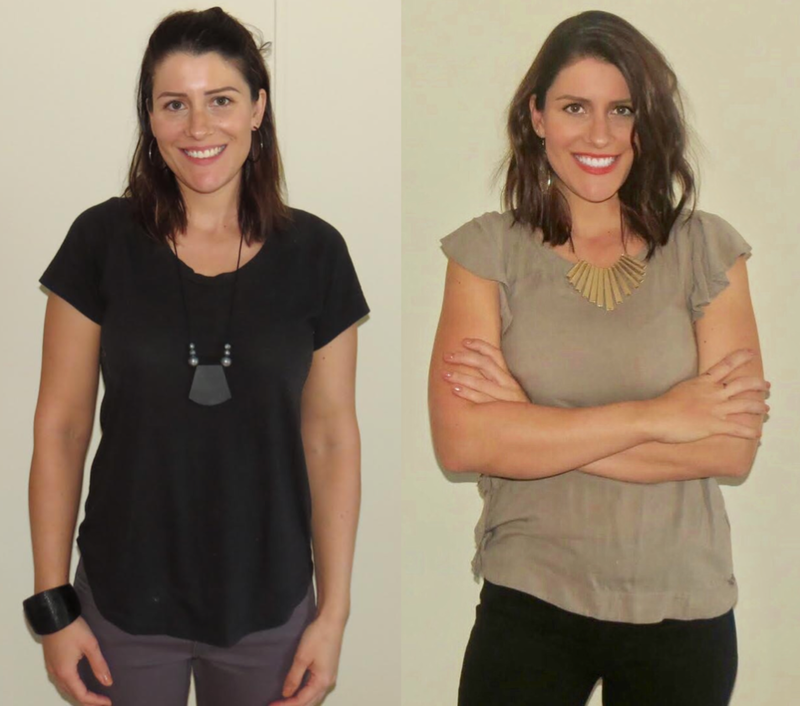 When I met Jacinta she had already started working on getting herself back on track. She had lost 20 kilos and had done lot of work trying to rediscover her purpose but there was still some more digging to be done. We worked together towards finding who Jacinta really was and how she used to feel, looking the way she used to look. During this process, Jacinta realized that she was playing it safe in every area of her life. This realisation, made her start assessing and reevaluating the current state of her life. She was capable of seeing clear examples such as how little she was being appreciated at work and how overqualified she was for the role she was in. This process of rediscovery translated into a career change to something very close to her heart. A sports and charity project, which has made her much more excited about life and left her feeling more confident and authentic. In my latest conversation with her, she told me about how attractive she feels and refers to what she describes as having many “Hollywood moments”. She has become more sociable and feels like she is walking on the red carpet every time she is out at social and networking events. Her confidence has emerged and she couldn’t be happier feeling alive again! I spoke to Kate a few times on the phone and I could hear that fierceness in her voice. But, when I met her in person the impression she created was of a very shy woman. Kate shared with me how she wanted to be seen as a confident, knowledgeable, intelligent, engaging and credible woman. She wanted to be able to speak with confidence and stop second guessing herself and holding back for fear of appearing silly. She is a marketing manager, a profession that demands a lot of confidence and a strong presence. She was about to give up her passion for marketing because she felt intimidated by the demands of it. She even started doubting her professional abilities compared to others in her department, which was making her lose her life-work balance. She felt inadequate in a world where image is paramount for success. She had become an expert at dismissing her dreams and a professional at blending in. Her presence and her way of dressing were plain, as she described them (she wouldn’t wear bold accessories or much make-up). She decided to take 'the risk' and overcome her lack of confidence. She decided to step up and work with me on building her image and developing the skills she needed to project the professional woman she is. From day one, she started feeling much more confident within herself. She got to know herself better, connect more to her desires and how she wanted to be perceived. She learnt about her body shape and was able to fully understand what styles and colours were perfect for her unique body shape and personality. She learnt how to make the most out of her presence and how to approach a conversation with confidence. She was finally able to bring out the smart and beautiful woman she truly is. Today, Kate has created a very unique image for herself - which includes bold accessories and make-up! On my follow up with her, she shared that when attending a meeting with her boss “ …you not only helped me to prepare for that meeting, you helped me to learn how to feel and be the woman I needed to be, to be able to stand out tall in front of my boss and be clear about what I needed to become more effective”. She now stands with confidence and is seen as the leader in her industry, just as she desired. She didn’t only succeed at her current role, she was promoted and now manages a supporting team that allows her to do her job in a more meaningful way. She has been able to manage her time better and balance her professional and personal life.